"Lots to choose from, including older hard to find Christian movies. Love the free shipping!!!" Faith Like Potatoes is an inspiring true story of a rugged South African farmer, Angus Buchan, and is set in the turbulent hills of the KZN Midlands. Angus' manic quest for material success is slowly transformed into a wild love for God and people, as he wrestles with faith, hope, natural disasters and tragic personal loss. 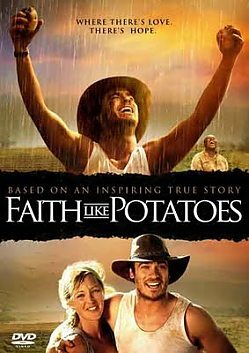 Faith Like Potatoes won the People’s Choice Award at the 2006 Sabaoth International Film Festival and Best Feature at the 2006 Mumbai International FICTS Festival. Faith Like Potatoes is one of the top 5 grossing domestic theatrical releases in South African movie history. When a child, parent, spouse, or sibling says they're gay. Lessons in initiative, tolerance, sportsmanship and more!